Fractures are one of the key geomorphological features that were predicted to exist in some form or another on the surface of comets, but were never directly observed in previous missions. However, the long-term duration of the Rosetta mission coupled with its high resolution cameras and its ability to operate at close distances (less than 10 km away at times) to the comet’s surface have yielded direct evidence for the presence of fractures on almost the entire surface. Image 2: Fractures are also observed in the margins of cliffs or scarps. Notice in the left panel the zoomed-in box that shows a fracture (yellow arrow) cross-cutting two older fractures (orange). 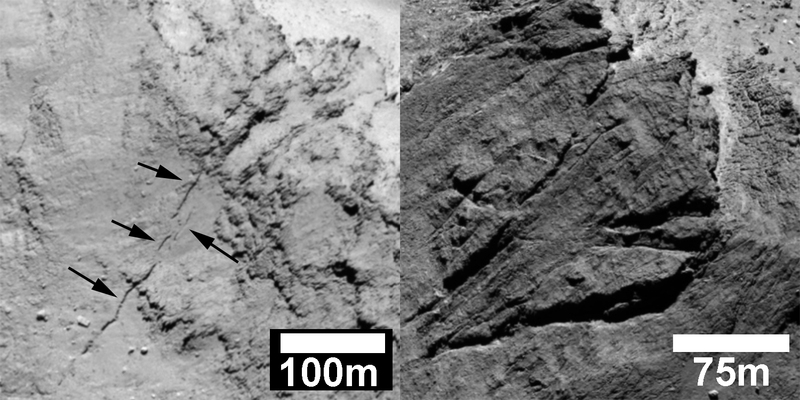 In the right panel, a clear evidence of mass wasting is seen at the foot of the cliff, which suggests that fractures are a key erosional pathway on the surface of comets. Moreover, these fractures appear in many shapes and sizes and in different geological settings. For instance, we observe fracture networks where linear fractures are intersecting at orthogonal or nearly orthogonal manner creating geometrical or polygonal patterns on the surface (see image 1). Another common setting for fractures is on the margins of cliffs or scarps that show evidence for mass-wasting or talus-like deposits at their feet (image 2). Fractures are also observed on large (20–30 m wide) boulders, and in some cases, the fracturing is so pervasive that it has led to fragmentation of the fractured boulder (image 2 left panel). 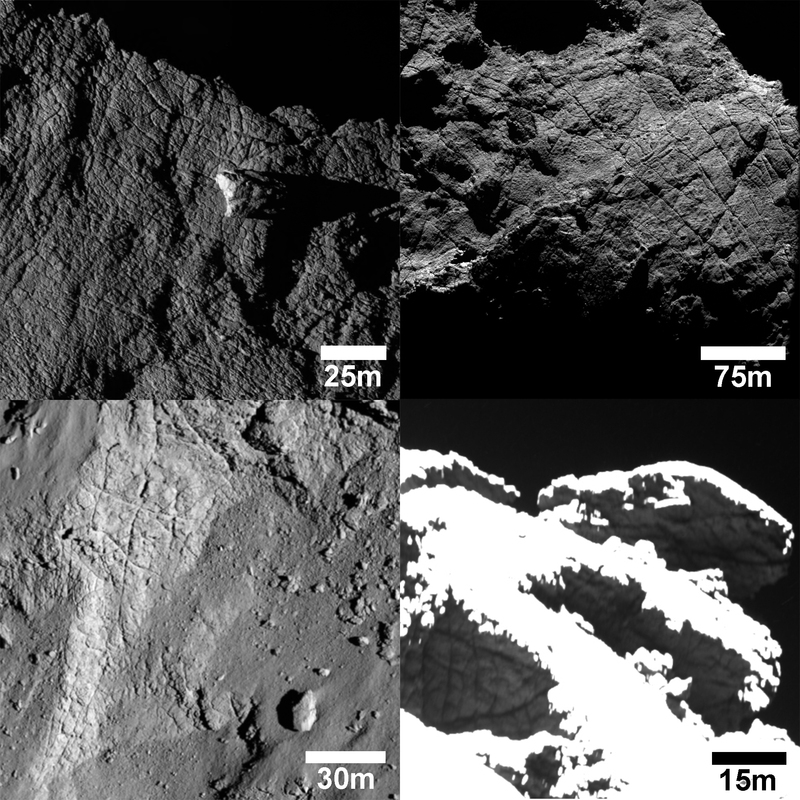 In addition to these common settings, a number of unusual or unique features are also evident such as a 500 m long fracture close to the neck of the comet (image 4 left panel) and >200 m long angular fracture system (image 4 right panel) in a region of the comet dubbed the Aker region (after the ancient Egyptian God) by the mission’s scientists. Image 3: Fractures boulder. Note in the left panel how the fractures will eventually fragment the boulder into smaller pieces while on the right panel the process is still in its early stages. So how are these fractures formed? the presence of many types of fractures in various settings suggests that many processes could be at work. However, the most plausible process is that of thermal insolation weathering, which is a common erosional process on Earth that affects rocks in climates characterized by high temperature fluctuations in day and night as well as seasonal temperatures. These high fluctuations would create large stresses in rocks leading to their fracturing with time (see references in the further reading section). However, other processes may be at work. Perhaps some of the polygonal fractures are similar to periglacial thermal contraction polygons that are commonly observed on Earth in areas such as Alaska, Siberia and northern Canada as well as on Mars in the high latitudes. These “permafrost” features occur as a result of seasonal temperature changes affecting a shallow ice-rich sub-surface layer. We know that comets are “balls of ice and dust” so it is highly probable that ice could be present very close to the surface and leading to the formation of periglacial-like features. Finally, the large unique fracture systems may have formed through other processes of a more “tectonic” nature, which could resemble tidal stresses that affected the comet during its close encounter with other bodies such as Jupiter or they could even be induced by the activity of the comet, which tends to increase greatly close to the comet’s perihelion or the segments of the comet’s orbit that bring it very close to the Sun. Image 4: Unusual fracture systems on the comet of possible tectonic origin. 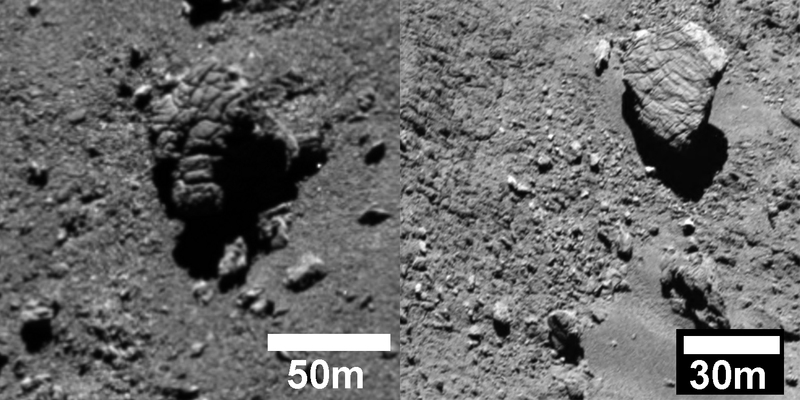 Left panel: a 500 m-long fracture on the neck part of the comet. Right panel: an angular fracture in the Aker region. Thomas, N., et al. (2015), The Morphological Diversity of Comet 67P/Churyumov-Gerasimenko, Science 347, doi: 10.1126/science.aaa0440. Sierks, H., et al., (2015), On the Nucleus Structure and Activity of Comet 67P/Churyumov-Gerasimenko, Science 347, doi: 10.1126/science.aaa1044.